Edradour Distillery Sign Established in 1825, Edradour is one of Scotland's smallest distilleries. It's a pleasant drive into the hills east of the town of Pitlochry. 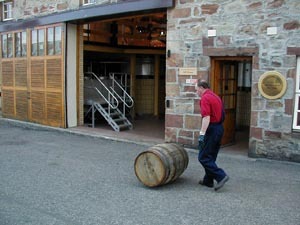 Production is carried out by only three men and total production in a week is only enough to fill around 12 casks. 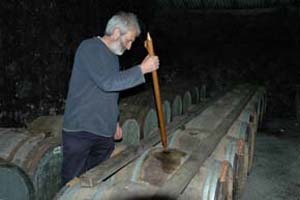 If you want to sample Edradour, then you better do it at the distillery, as production is so low, it is the only spot guaranteed to have supplies. One of the blends made at Edradour is called Houses of Parliament, which, oddly enough is only on sale in London in the Houses of Parliament and at the distillery itself. The distillery has recently been purchased by Andrew Symington's Signatory company and it has been made his centre of operations for their single cask bottlings from all over the country. With the new owners, an expansion in bottling and production has taken place and soon it will be more easily obtainable, but there are just limits to what such a small distillery can produce, so keep a look out for this rare malt. 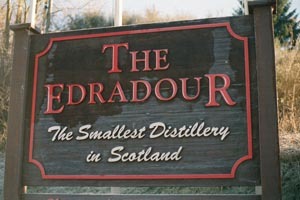 Edradour, not surprisingly, is probably one of the top three visited distilleries in Scotland. It is also one of the prettiest - small whitewashed buildings, nestling in a little river valley, the stream bubbling and dancing through the centre of the distillery. Black slate roofs and bright red doors, complete this lovely picture and on a sunny day with a bright blue sky, makes the perfect distillery view. 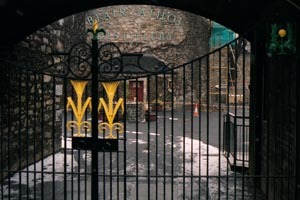 One of the smaller distilleries in Scotland situated next to the Royal estate of Balmoral, a short distance from the castle where the Queen and her family like to spend the Summer. 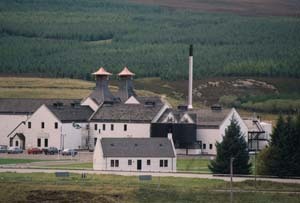 Lochnagar mountain rises to over 1000 metres behind the distillery. The name comes from the time of Queen Victoria, when she and her husband Prince Albert visited the distillery and started purchasing the whisky. Small production doesn't stop the 12-year old from being a member of Diageo's Classic Malts series, although only one of the second batch included in the series. That wonderful marketing idea started with six distilleries supposed to reflect all the main areas of whisky production, Islay, Speyside, Lowland, etc, so when they added six more, it wasn't representative of where the different brands came from, just an expansion of a very good idea. Only somewhere around 60,000 bottles are released each year as the majority of production goes into Johnny Walker Blue and Black label brands. The 12-year old is a sweet, orangey malt with a lingering, but very slight smokiness, which comes from the very small proportion of peat smoke used when malting the barley. A creamy mouth feel, but quite a short finish, which doesn't linger like some more peaty malts. Very pleasant. This is quite a dark and malty whisky. A strange thing to call a malt, malty, but it is the flavour of the malted barley which is slightly evident in this whisky, more than many others. If you have ever made your own beer from a kit, or drunk Ovaltine or other malted hot drinks, you will recognise this maltiness. We never stop saying how, in general, the whisky distilling industry is staffed by friendly, welcoming and very knowledgeable people and Royal Lochnagar is a good example of this. 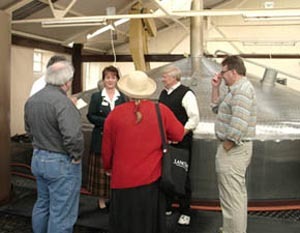 The tour, whether given by a visitor centre, staff member or somebody directly involved in the production of the spirit, is more detailed and in depth than many distilleries. Owned by White and Mackay, who also own the Isle of Jura Distillery and nearby Invergordon, the largest grain distillery in Europe, Dalmore was, for a long time, owned by the Mackenzie family, before they amalgamated with W&M. Legend has it that in the 13th century, a member of Clan Mackenzie saved King Alexander III from being gored by a stag. The King allowed the head of a "royal" stag, that is one with 12 pointed antlers, to be used on the clan emblem and the motto, Cuidich 'N Righ (Help the King), be used by the clan. The royal stag head adorns bottles of Dalmore today. Richard Patterson, the Master blender at Dalmore, might be said to have a head start in his blending, as Dalmore has such an odd collection of stills. They have one spirit still twice as high and large as the other three and this produces a lighter more aromatic spirit than the "chunky" stills, which produce a more punchy, richer and fruitier spirit. Dalmore Distillery Washbacks The four wash stills have flat tops, which are really unusual and who knows what effect that has on the spirit. 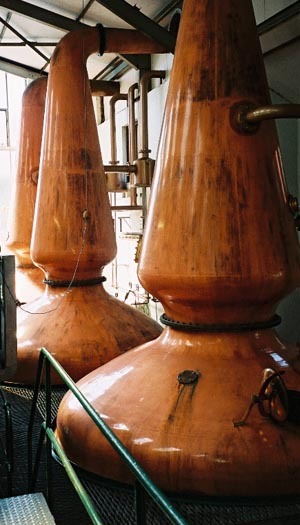 Suffice to say in an industry where traditional and historical customs dictate that, when stills are replaced, they are replaced with the exact size and shape as previously and in some (perhaps apocryphal) cases, with the same dents and bumps as the previous stills, should the stills be replaced, the shape will be retained. We all have our feelings about how much each element of production contributes to the end product - barley, yeast, water, the stills, the kinds of casks, the blender's skills, but the bottom line might be said to be, if it ain't broke, don't fix it! Everything contributes and whatever the magical element, a change in production can change the result. Having said that, you could give Richard Patterson a dozen stills of exactly the same size and he would still give you an end product of style and grace. Rich and fulsome, orange and spicey fruit, all the characteristics of using a large proportion of sherry cask-matured malt in the mix. Dalmore Distillery We savour the little remaining of our cask strength 1990 and think of Drew Sinclair, former Manager of the distillery, who sadly passed away not long ago. A man the phrase, "missed by all who knew him" is truly meant for. In Gaelic, Glenmorangie means Valley of Tranquility. The distillery which has the tallest spirit stills in the Highlands, at over five metres, lies below the Tarlogie Hills on the banks of the Dornoch Firth, some way North of of the town of Inverness. 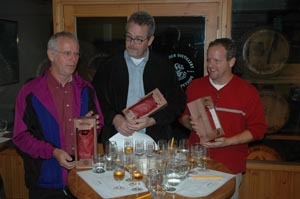 Production is limited to the distillery's own bottlings and there is none used in blends. 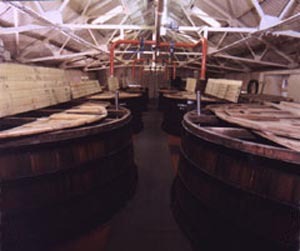 Glenmorangie Mash Tun Production is now running at 4 million litres of acohol per year. The high stills produce a pure, clean spirit and various expressions are now being bottled. The Original, which I believe is bottled at ten years old, is matured in first use ex-bourbon casks. It is light, delicate and flowery with a lovely smooth finish. The distillers claim on their website that this is "...quite simply, the most delicate and deliciously complex single malt whisky in the world". I think you truly HAVE to believe in your product to make such a strong statement and Glenmorangie obviously do. New Expressions include the Quinta Ruban (Ruban is Gaelic for ruby, the colour of this interesting whisky) which spends a period in port pipes, formerly used for maturing Port. The Lasanta (meaning warmth, passion in Gaelic) is finished in Oloroso sherry casks and there is orange fruit, raisins and a rich sweetness. Almost a comfort food of malts. There is an 18, where after 15 years in bourbon casks, a proportion of that to be used is stored in Oloroso casks for three years. This influences the finish substantially and almost results in a concentrated Lasanta. Soft and long lasting. Glenmorangie plc own Ardbeg Distillery on Islay and Glen Moray on Speyside and they are, in turn, owned by the multinational, Moet Louis Vuitton Hennessy (MLVH). One of the best known brands across the world, Glenmorangie was one of the first malts to be exported as a single malt. Now in the LVMH stable, their position as a major brand and export malt will surely be enhanced. Glenmorangie Still House Glenmorangie is also the biggest selling malt inside Scotland, which either is a comment on their marketing skills, or, more likely, a recognition that this is not only one of the best known malts, but one of the best. The 16 Men of Tain was a marketing construct to show that only 16 people were involved in the production of Glenmorangie, but that these were skilled and knowledgeable men, many with a lifetime in the industry, many related to others in the whisky industry. The world of whisky is close-knit even today. It comes as a surprise to many, how few people it takes to make whisky - a mashman, a stillman and a warehouse man, is a basic shift. The more shifts you run, the more stills you have, the more you make, the more people you need. With in-house malting floors, like Bowmore or Balvenie you need even more. 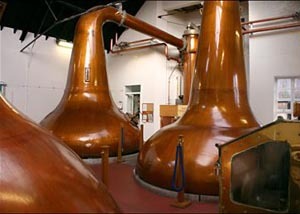 In fact, Glenmorangie's 16 men is on the high side for production and is reflected in the amount they produce. Bill Hutton former Glenmorangie Manager and now the group's Head of Distilling and Whisky Creation was named Distiller of the Year in 2007. Bottle your own at Aberlour © Joe Photo Aberlour Distillery delivers one of the most comprehensive and top quality tours and tastings in Scotland. Long before other distilleries latched on to developing more extensive tours with extra tastings, Aberlour's two hour plus tour and tutored tasting ended with five samples of different malts and one of the newly-distilled spirit. Such a comprehensive tour is pretty common nowadays and Glengoyne even offer you the opportunity (for considerable cost) of blending your own bottle of malt. Glenfiddich and The Macallan in the same area as Aberlour, now offer specialised and extended tours and tastings, but Aberlour probably still remain the best organised and definitely the best value. Aberlour Distillery Aberlour is owned by Pernod Ricard, the world's second largest drinks company, who also own The Glenlivet, and Strathisla Distilleries on Speyside. The marketing thrust of Pernod Ricard has pushed Aberlour into much greater prominence in the world of single malts and it is now available all over the world. Lucky world! The Aberlour 10 year old is one we consider a perfect introduction to malt. Some of the richer, spicier and smokier flavours found in lots of malts are not too evident here. It isn't so challenging as some but is definitely as satisfactory as any. The mix of bourbon and sherry casks give it a spiciness, with light fruits, pears, apples and a hint of sherry orange. This is a honeyed and smooth experience. It is a whisky you can give to somebody who KNOWS they don't like whisky and completely surprise them. The Aberlour a'bunadh, bottled at cask strength, from only Oloroso sherry casks, is a wonderful, rich, orangy malt. The mouth coating texture leaves lingering tones of dark chocolate and ginger. Some add water to their malts and whatever you prefer is right, but we think a'bunadh is perfect all alone. Glenfarclas literally means valley of the green grassland. Distilled on the Ballindalloch Estate, on Speyside, since a licence was granted in 1836, the distillery started to grow when it was taken over by the Grant Family who are still owners today, 6 generations later. They paid just under GBP600 for the distillery. Now, I have a few spare notes, I wonder what's available on the market today). This malt is always matured in Spanish Oak sherry casks, which give it its rich amber colour and its mellow and slightly sweet flavour. At Glenfarclas they like to boast "the only thing that has changed in 165 years is the label." 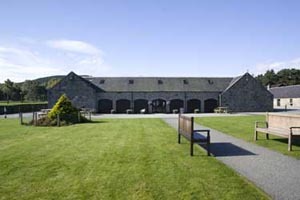 Glenfarclas Distillery Visitors Centre In late 2007, Glenfarclas launched their family casks, a series of 43 single cask bottlings with one cask chosen from each year from 1952 to 1994. This is surely the first time this has ever been done and we are hopeful of getting our hands on one before they rush out the doors, or at least a taste of one. With over 52,000 casks in storage, this could well happen again in the future. Distillery of the Year in 2006, Glenfarclas really do make other distillers sit up and listen and innovative ideas like the Family Casks will continue to flow into the future, we are sure, with George Grant now working with the distillery, following in the footsteps of his Father, John, current Chairman of the family firm. 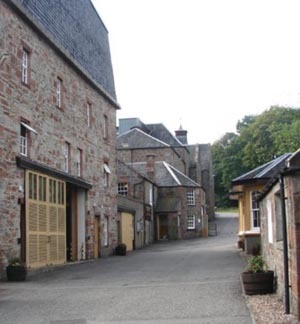 Glenfarclas is one of our favourite tours on Speyside. It is not a classically pretty distillery like Ardbeg or Edradour, being more industrial-looking, but the traditional ways of producing top class whisky are safe with the Grants of Glenfarclas. The highest distillery in Scotland, midway between Perth and Inverness and situated at 326m/1073ft, Dalwhinnie is in a glen with the Monadhlaith Mountains on the one side, the Forest of Atholl, the Cairngorms and the Grampians to the other. Dalwhinnie is Gaelic for "meeting place" and the village stands at the junction of old cattle-droving routes from the west and north down to the markets of Crieff and Falkirk in the Central Lowlands. Dalwhinnie Distillery Dalwhinnie can be a very isolated spot and needs to be completely self-contained during the winter months. 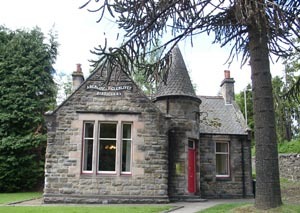 It has a special hostel for staff when blizzards cut off the distillery from the outside world. The water comes from the Allt an t'Sluic spring, bedded in granite, which feeds the Spey and the malt is a major factor in the Buchanan's and Black and White blends. Dalwhinnie is one of Diageo's "Classic Malts". Whoever registered that name should be given a payrise. It is a beauty and whatever you feel about multinationals owning distilleries, the Classic Malts are a brilliant marketing scheme, oh and pretty good whiskies too. Dalwhinnie 15 year old is the main expression from the distillery and it is a fruity-sweet, light-bodied easy-drinking whisky with a smooth finish and floral/heathery notes. The whisky industry always likes to tell us all the things that affects whisky flavours and the water used in Dalwhinnie, springs up after draining down through the highland slopes behind the distillery, where in Summer, it is purple with blooming heather. We still refuse to believe that is why the heather aromas are there, though! Smoking your barley over peat fires, yes! We are willing to accept that affects the flavour, but water draining down past the heather roots, we don't think so, thanks. Anyway, a lovely and easily approached malt is Dalwhinnie and a Classic one indeed. Blair Athol Distillery The Blair Athol distillery is set in a lovely spot in the historical town of Pitlochry, surrounded by beautiful scenery. The Allt na Dour burn runs through the distillery grounds, but the water used in the distilling is taken from the Kinnaird Burn. 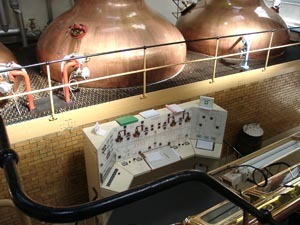 There has been an illegal still at Blair Atholl since 1798 and it became a legal distillery in 1825. 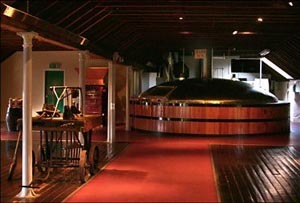 This malt is used as a major ingredient of the popular Bells Blend and the visitor centre features the World of Bells. As it's a major contributor to the Bells blend, one of the most popular blends in the world, there is only a small amount available as a single malt. The 12 year old is the main attraction, but occasionally cask strength bottlings are on offer and both Cadenhead and Signatory have issued their own label Blair Athol. Blair Athol Stills The 12 year-old is a fruity and lingering dram, very smooth and one which somebody new to drinking malt whisky would take to easily. Diageo, the world's largest drinks company, own Blair Athol through UDV and they are always aiming to streamline whisky production and make efficiency a strong theme in their production. 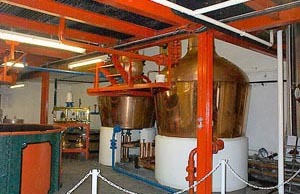 However, malt distilleries are havens of tradition and the production of single malts follows a process which cannot be changed, so even at the heart of a distillery which contributes to the biggest selling blended brand in the UK, whisky production follows the same path as it has always done, the distillery is old and venerable, the ivy flourishes on the old red brick walls and the staff show the same love for their task as is seen in all Scottish Distilleries. We love distilleries!! Situated on the South East coast of Islay Ardbeg has produced whisky in the present distillery since 1815, the year of the Battle of Waterloo. Whisky had been produced there, though, for many more years before that. In 1886, production was running at 250,000 gallons a year. The typical Islay flavours abound in this whisky, peat smoke, seaweed and that ocean influenced hint of iodine. A robust and lingering flavour and possibly to be treated carefully by a novice whisky drinker. The walk between Ardbeg and Laphroaig distilleries must be the highlight of any distillery tour. The single track road runs through woodland near the shoreline and the total distance is about one and a half miles. Ardbeg Distillery Old Kiln Cafe A pleasanter day can't be imagined for the enthusiast, with a tour and tasting at Laphroaig, followed by the lovely walk to Ardbeg Distillery and lunch at the excellent Old Kiln Cafe followed by an another tour and tasting! Follow it with a trip to the 9th century Kildalton Cross a few miles on from Ardbeg, one of the best preserved of the Celtic High Crosses. 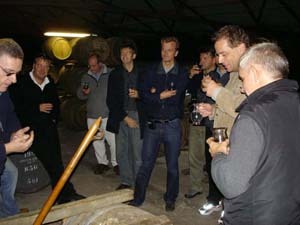 Ardbeg is owned by Glenmorangie plc and there are three distilleries in the group. As well as Glenmorangie and Ardbeg, there is also Glen Moray from Speyside which means they cover all the various regions and flavour profiles. 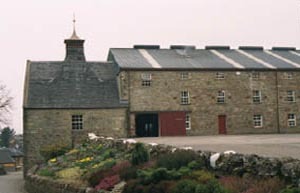 Glenmorangie, in turn, are owned by Moet Hennessy, part of Moet Louis Vuitton Hennessy. 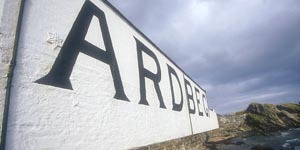 Bought by Glenmorangie and reopened in 1997, after a period of silence, Ardbeg has outstripped all expectations under the managership, for nearly ten years, of Stuart Thompson and carrying on his good work, is ex-Isle of Jura Manager, Mickey Heads. There are several excellent expressions available, but our favourite is the cask strength Uigeadail, named after the loch from where Ardbeg's water comes - Ardbeg smoky, as you would expect, but sherry sweet and lingering on the palate. In the years since the first distillation, Ardbeg released some much younger bottlings than most distilleries would normally issue, Very Young, Still Young and last year, Almost There, which allowed their fans to taste what Ardbeg is like, as they describe it, as a "work in progress". A 10 year old is now available and will likely be the base level age to be bottled. When you market something, it is always nice to have a product that almost sells itself, but the people at Ardbeg and Glenmorangie excelled themselves quite recently when, during bottling, casks of Ardbeg and Glen Moray were poured into the same vat. This "disaster" meant that they now had a vatted malt instead of two single malts and something completely unplanned. It was duly tasted, hopefully after not too many involved were shown the door, and declared to be a perfect marriage of the two singles. Given the name Serendipity for this lucky chance happening, the stuff fairly flew off the shelf. While pleasant, we prefer the two single malts taken separately, but we LOVE the way they made a feature out of it and while all distilleries try to ensure their generic branded product stays the same for the main market, from batch to batch, Glenmorangie made a positive out of an almighty negative and showed great swiftness of thought. Bowmore Distillery Bowmore is owned by the Suntory company of Japan, but lovers of good malt need have no fear of any dilution of the character and long tradition of this, one of Scotland's and one of Islay's oldest distilleries. Suntory have maintained the line of the Morrisons as hands-on producers of this smokey, chocolatey malt. The distillery and the island's main town were established at the same time around 1779. Bowmore is one of only five distilleries in Scotland with their own floor maltings, which like Laphroaig, allows them to ensure the correct amount of phenols (or peatiness) in their malted barley. The maturation warehouses on the banks of Loch Indaal are lapped by five feet of sea water at high tide and this definitely lends to the hint of salt and seaweed in the nose. More recently, the distillery has been bottling an extended variety of finishes, such as the Bowmore Darkest, which is finished in Oloroso butts and the Dawn, filled in Ruby Port casks. The 12 year old is their flag bearer and is a lovely, rich, peaty, lasting malt. The Enigma 12 year old is a great choice if you want to introduce somebody to a peaty malt for the first time. The extra sweetness in this dram, will make the rich smoky depth seem more palatable for the first timer. Currently this is one of our favourite Islay malts. Bowmore Distillery Bowmore is the only distillery to have won three Double Golds at the prestigious 2007 San Francisco Spirits Competition and their 18 year old was unanimously voted 2007 Single Malt of the Year. We can't wait to try it! The new visitor centre is a sign of how distilllery visits are viewed by the major Distillers nowawdays and is comfortable, with lovely views over Lochindaal, as you take your after tour tasting. From the start, this distillery was intended as a high ouput producer of malts. Most of its production was earmarked for blending with other malts, but the distinct flavours found in this malt has led to larger quantities being bottled as the single malt, which has gained a good reputation as a slightly different Islay malt. Lighter and less peaty than most, with a smooth palate and long full sweet finish, with just a hint of Islay smokiness. Built around a courtyard, the distillery, like Caol Ila, clings to the Sound of Islay and Jura is ever-present across the fast moving waters. Built in a remote area of the island, the community of workers and their families built with the distillery and a village hall and small schoolhouse sit high above the distillery. A peaceful place at most times and a lovely situation looking out to the Paps of Jura. Black Bottle is the blend whisky based on malts from all Islay distilleries, but mainly Bunnhabhain and is possibly the one blend we find enjoyable :o). Certainly the most peaty of blend whiskies available. Bunnahabhain Distillery might be the Islay malt least known to our overseas (especially North American) clients and possibly the one they enthuse to us most about, after their visit to Islay. As with all the distilleries on Islay, the Manager at Bunnhabhain is an Islay man, Andrew Brown (in the case of Lagavulin, an Islay Woman). This has not always been the case, but it gives Islay distilleries a feel, slightly different to most mainland distilleries, a warmth of greeting, stronger and more relaxed than most mainland distilleries. The whisky industry is a welcoming one in general, but on Islay, it is more strongly noticeable. Laphroaig Distillery Founded, like its near neighbour, Ardbeg, in 1815, the traditional malting floors, like many of the other original buildings, still exist and the malt is still turned by hand throughout the seven day germination period, to ensure the maintaining of an even temperature. Laphroaig with its archetypically dark, oily and peaty Islay malt is one of the top selling malts in the world. The somewhat sharp iodine and seaweed hints led to it being available thoughout the Prohibition Period in America, as "medicinal spirit", which went a long way to cementing its position of favour on the US market. The name means "pretty hollow by the wide bay" and it is a lovely situation for a distillery. The peatiness is a trade mark of Laphroaig and would be the one all whisky drinkers would first think of, when discussing peaty whiskies. The ten year old is the main seller and the best selling Islay Malt in America. 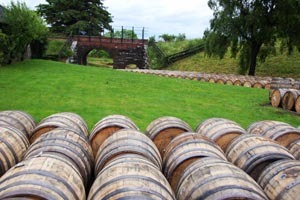 There are various age expressions and a new expression, the Quarter Cask, is using smaller barrels for the latter part of the distillation process to allow more of the whisky to be in touch with the wood and intensify the flavour, a process almost lost, as distillers went for the larger casks as they produced more. Laphroaig Distillery The Cask Strength Laphroaig was voted Best Single Malt in the World by Whisky Magazine in 2005 and we wish to thank the staff of the distillery for producing what is one of our all-time favourite malts! Laphroaig is probably not a malt you would use to introduce first time whisky drinkers to malt whisky, with the strong smoky flavour tending to overpower, a little, the more subtle and fruity flavours. Some say it is an acquired taste (although we all acquired it pretty quickly), but if the peaty smoky ten year old best seller, is Laphroaig's signature taste, then the Cask Strength is that taste, concentrated and intensified until perfection is reached (yes, yes, you can probably see we like this). 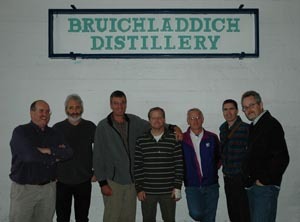 The Bruichladdich Distillery which sadly stopped production in 1994, was bought by independent bottlers Murray McDavid at the end of December, 2000 and they took Jim McEwan of Morrisons Bowmore Distillery to be Production Director and Master Blender. Fortunately for whisky lovers the sad and neglected site is once again a thriving producer of fine whisky. Bruichladdich Distillery Shop Questions were asked whether the lighter Bruichladdich style, with its moss and almond flavours, delicate nose and oily texture would be replaced by the more "obvious" sea and peat flavours of Islay. Since then, "The Laddie" has opened to visitors and is winning medals and prizes including three times being voted "Distillery of the Year", once "Distiller of the Year" (third time for Jim McEwan) and once "Innovator of the Year". In 2007, they were chosen as "Pioneer of the Year" for their innovative selections and bottlings and their experimentations in "added value" whisky, whereby they finish their malt in various different types of cask, for a short period, usually around six months. Our favourite is the Chateau d'Yquem finish - the famous desert wine's casks gives this a honeyed, rich and bountiful finish - Whisky Magazine rated it the top non-peated Islay malt in 2007. Bruichladdich for the first time for any distillery, in around 200 years, recently quadruple distilled a batch. 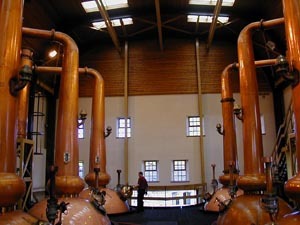 All distilleries in Scotland, except the triple distlled Auchentoshan, double distil. Quadruple distilling resulted in a strength of 92% alcohol. Tasting a tiny drop when it had come down to 89% brought back childhood memories of a sherbert bomb, a sweet which if you are old enough to remember, when bitten into, exploded out of your ears, nose and even eyes, or so it seemed. X-4 does this as well, but with knobs and bells on. It is impossible to describe the richness of fruit which remained on my palate for the rest of the day. Not since I tried a 40 year-old Laphroaig has a flavour stayed with me so long. I don't think I actually managed to swallow any, as it all evaporated on my tongue, instantly! Bruichladdich Distillery © Joe Photo A decision to bottle on-site sets them aside from other Islay distillers. As does the main bottling which retains the delicate nose and light flavours mentioned above. 75% of production goes to the main brand and the phenol count (peat content) is 3 parts per million (ppm). 13% of production is the single malt, Port Charlotte with a phenol count of 40ppm, right up there in the peat lists with Ardbeg, Lagavulin and Laphroaig. 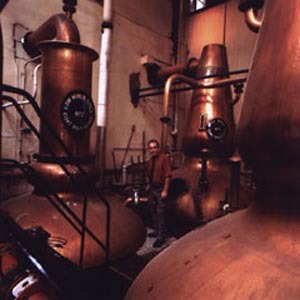 The other 12% of production is in the form of Octamore, the peatiest whisky in the world! A staggering phenol count of over 80ppm, yet, perhaps due to the long narrow necks of the stills, a refined and smooth, satiny finish, following a knockout nose. The distillery even has a futures market on this product, they are so convinced of the wonderful result they'll have in a few years, when they come to bottle. 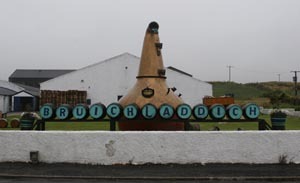 Bruichladdich Distillery © Keiren McArthy A programme of futures issues has helped ensure the distillery broke even years ahead of expectations. Many distilleries have been taken out of cobwebs over the last 10-15 years, but mainly by the larger distilling giants, seeing a huge upturn in the global single malt (and blend) market. 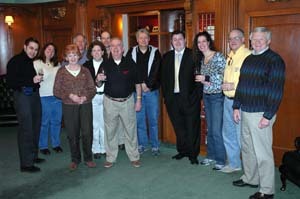 The Laddie is a success story involving people who care about whisky and care about the community. 17 people now work in the distillery, which might not sound like many, but when you think of the "16 men of Tain", the huge advertising campaign for Glenmorangie, where the whole process is done by 16 men, then much smaller Bruichladdich has made a significant difference to the lifes of the community of which they are the centre. Isle of Jura Distillery The first licence to distil on Jura was issued in 1831 and production of a typically peaty island malt continued up to 1901 when a dispute between the island laird, who was the landlord of the distillery, and the distiller resulted in the distillery being closed until 1963. During this period the roof was taken off to avoid paying taxes on the buildings. When production restarted in 1963, larger than normal stills were used which has resulted in a lighter, more typically Highland malt, with a gentleness and balance which still retains a subtle peaty background. 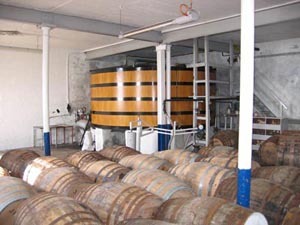 Of all the Islay and Jura Distilleries, only Caol Ila has a larger capacity. 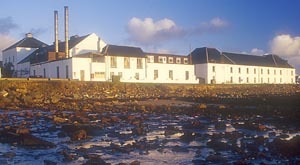 The distillery sits opposite the island's only hotel, The Jura, and just above the small harbour, with a beautiful view looking out to the Small Isles. 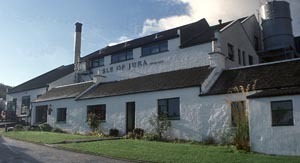 The Isle of Jura Distillery is not the typical island distillery - low-slung, whitewashed buildings clinging to the shoreline, large black letters proclaiming the distillery's name to passing ships, but a much more pragmatic affair. Still white washed, but somehow chunkier, yet, once past this facade, the friendliness of the island staff and the beautiful smells leave you in no doubt where you are. Owned by White and Mackay who also own four other distilleries including the massive Invergordon grain distillery. A 21 year old was issued in 2005 to celebrate the writing on Jura of '1984', by George Orwell. This whisky, distilled in 1984, is a rich, golden beast, heavily sherry influenced, unlike the normal lighter Jura whiskies, but sadly this is being replaced by an 18 year old. We are assured there are still elements of the 21 in the Superstition. Superstition is a far peatier Jura than the normal, much more akin to most of their Islay friends across the water. The excellent 10 year-old and a 16 are also available.The only way to access Jura, without your own private yacht is the small ferry from Islay, which runs throughout the day. There is only one road on the island and about 200 people. As there are over 5000 deer on the island, statistically, you are more likely to see them than people. Jura is a beautiful and peaceful place.